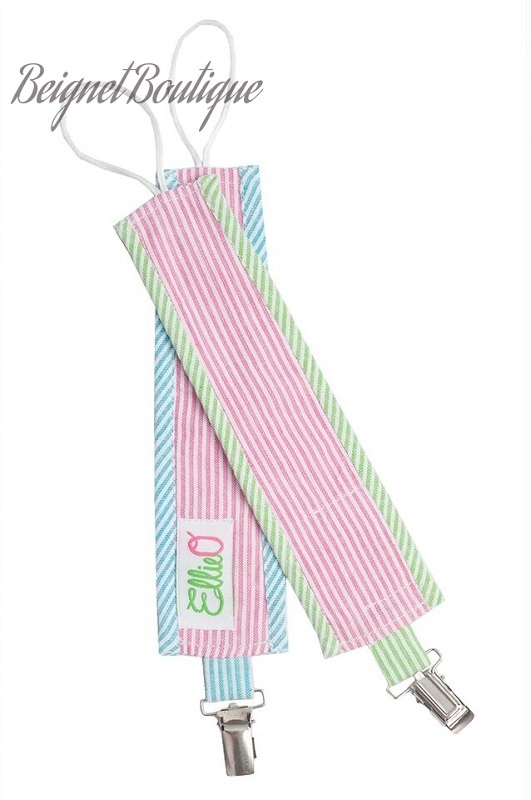 Designed to match our Seersucker Baby Collection.....Keep your baby's pacifier close at all times with these adorable, classic paci clips featuring pink seersucker with green seersucker trim and pink seersucker with blue seersucker trim. They make the perfect accessory gift to our seersucker bloomers, or our seersucker bib and burp cloth sets. Can be personalized with baby's name or initials in a single thread color. Pacifier clips come in a set of two (2). *Please indicate your choice of one thread color, the desired name or initials for personalization, and font choice.